My haut, retour au début twelve actors...who is your favourite ? What foreign language(s) do toi also like to watch films in? Who has that most Movie étoile, star Glamour look of the female people? Will anyone rejoindre my new spot for 'A Streetcar Named Desire'? Recently, I searched my memories for any films produced outside of the United States that not only won the Academy Award for Best Picture, but I would also consider a personal favori of mine. Only one came to mind - the 1963 movie, "TOM JONES". If anyone has ever read Rafael Sabatini’s 1915 novel, "The Sea Hawk", he ou she has clearly seen that the so-called 1940 film adaptation with the same titre . . . is not the same story. I have never read Sabatini’s novel. But I have a friend who has. And according to him, the 1924 silent film adaptation bore a closer resemblance to the novel. Hi guys, I had seen this film many years il y a and I immediately feel with the film. Especially Judy Garland's portrayal of Dorothy Gale, so here is my review on this 1939 classic. I really l’amour how the film starts of as a sepia tone, it wasn't only until Dorothy lands in Oz that it became multicolour. It was like stepping into a storybook universe that we always dream of! I always l’amour Margaret Hamilton's portrayal as the Wicked Witch of the West, I kind of feel bad when she was killed of! But, Dorothy has no choice at all. Hi guys, I will be écriture 2 horror films and they're The Innocents and The Haunting. Both films are based on novels and I'll write a review about them right now. Considering that was made in the 60's and there were no modern technologies for CGI at that time. I l’amour how they use the Psychological fear that are shown in both Nell and Theo. Tyrone Power's career took a strange turn during the post-World War II years. Although he still managed to maintain his position as one of Twentieth Century Fox's haut, retour au début stars during the remainder of the 1940s, something happened as the 1950s dawned. Powers still found himself in Grade A films during that particular decade. But he also seemed to appear in a growing number of standard costume melodramas. Adultery is rarely treated with any kind of maturity in fiction - whether in novels, plays, films and television. I am not saying that adultery has never been portrayed with any maturity. It is just that . . . well, to be honest . . . I have rarely come across a movie, télévision series, novel ou play that dealt with adultery in a mature manner. ou perhaps I have rarely come across others willing to face fictional adultery between two decent people with some kind of maturity. Hi guys, since this is my first article on the fan club. Here are my liste of favourite classic films that I grew up with, ready? This famous musical was the earliest that I saw and I l’amour the songs, but favourite scene was definitely the Small House of Uncle Thomas. I l’amour how the setting is Thai even-though the story is American. I am not one of those movie amoureux who seemed to my selection of films to one particular genre ou period in filmaking. Nor do I regard films from one particular era to be superior to another. I either enjoy an individual film ou I do not. a pop quiz question a été ajouté: Name the film ? 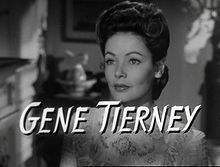 What movie is Gene Tierney starring in the is picture?